This is part review, part heads-up. I just found these cases today on sale at the local Kaybee Toys, and thought I'd let folks know about them. Perhaps you've seen them before, but this was the first time for me. 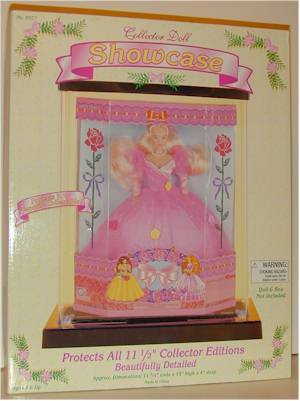 They're called 'Collector Doll Showcase', and the box is in the picture below so you know what you're looking for. They are designed to hold Barbie style dolls, including the box. They are 11.75" wide, 15" tall, and 4" deep. They come with a black plastic base and top and plexiglass sides. 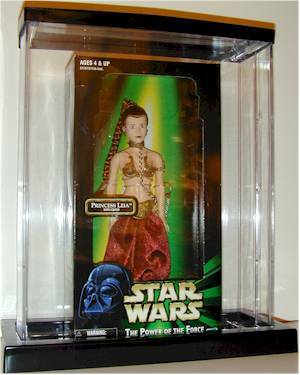 These types of cases are most useful for loose figures, particularly clothed figures. Dust plays hell with these clothes over time, and often cleaning them is near to impossible. Having a case to keep the clothes fresh and bright is always useful. The picture below demonstrates that they can hold the average Star Wars boxed 12" figure just fine, although they are too small for the extra deep boxes. They are also too small to hold two loose 12" figures comfortably, but they can hold two 9" figures nicely. The extra space in height can allow you to place some sort of interesting background picture on the back of the case, clearly visible behind the figures. On the left you'll see a 21st Century figure alone inside the case - my plans for the case I bought are very specific. I have just received my Tom Hanks head (thanks Sam!) and have the Hasbro Ranger figure on order from KBtoys.com. 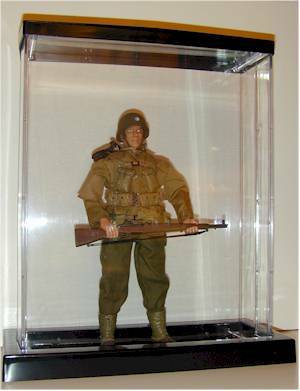 I'll put the Hanks head on the Ranger body, and place him in this case alongside the Ranger box. I may also place some sort of Saving Private Ryan mini-poster in the back. 4/21/00 update - I have heard from some folks who have found the acrylic case broken when they got these home. I'd suggest checking them at the store.